It was back in May that Fred Tangeman and I visited Puerto Rico as part of PHS's first collecting and outreach trip to the island, but I still remember the sights and warm conversations distinctly. As we landed in San Juan blue tarps spotted the surrounding hills eight months after the catastrophic landfall of Hurricane Maria--which we now know killed 2,975 people , or 46 times the initial government death toll of 64. Next to the tarmac basked the green serrated shapes of massive iguanas, soaking up sun between rain showers. We drove to the San Juan neighborhood of Monteflores, where we would stay for the next three nights at La Casona , a hostel adjoining La Iglesia Presbiteriana Reverendo Ramon Olivo Robles . The Monteflores Presbyterian Church, like many Puerto Rican congregations, carries both a common and commemorative designation, this one named after its first installed minister. Our first morning in San Juan we met with Dharma, a candidate for ministry under care of the Presbytery of San Juan, and two longtime members of the Monteflores church, Ana and Mary Lucy. We flipped through session minutes and registers, heard reminiscences about growing up in the congregation, and collected church bulletins. Beyond the windows the narrow streets and ubiquitous wrought-iron fencing of Monteflores reminded me of Philadelphia. Clockwise from top: Ana, Dharma, and Mary Lucy; Monteflores church; records from Hugh O'Neill church; Street leading to Blue House, 2018. Our next stop was La Iglesia Presbiteriana Hugh O’Neill , the second oldest Presbyterian church on the island and the congregation of Rev. Luis José Ocasio Torres, who worked with PHS Executive Director Rev. 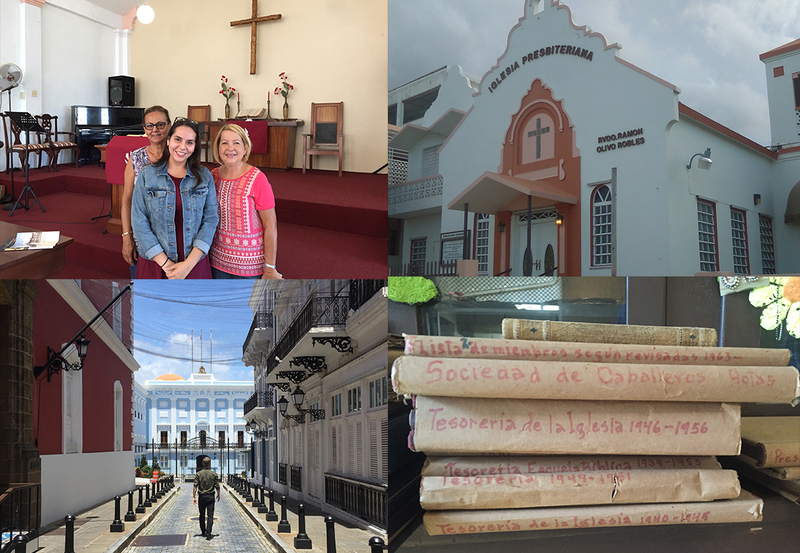 Beth Hessel to organize our trip; Flor Vélez-Díaz , Manager of Judicial Process and Social Witness for the Office of the General Assembly, helped connect us with Presbyterians in Puerto Rico. Special thanks also go to Independent Presbyterian Church  in Birmingham, Alabama, for providing financial support to PHS for this collecting and outreach effort. La Iglesia Presbiteriana Hugh O’Neill is only a hundred yards from the Blue House, or governor’s mansion, in Old San Juan. Luis José led us through a tiled courtyard into the church’s Christian education room, where he pointed to a row of cabinets holding the complete records of the congregation, from its organization as the Second Presbyterian Church of San Juan in 1904 to 2001. I made a quick appraisal, left behind financial records of temporary value, packed volumes in plastic bins, and joined Luis José and Fred for a mofongo lunch at a nearby restaurant. Luis José is not only a pastor and member of the Committee on the Office of the General Assembly , but also a clinical psychologist who specializes in treating victims of trauma. As we drove away from Old San Juan's cobblestone streets I thought about the intimate account Luis José gave us of life on the island in the wake of the hurricane--of Puerto Ricans returning in some ways to life as normal even as they anxiously prepared for the first hurricane season since Maria. View north from La Casona, 2018. As Fred and I searched in vain for a shipping store to mail the records from La Iglesia Hugh O'Neill back to Philadelphia we passed Hiram Bithorn  Stadium, named after the first Puerto Rican-born player in Major League Baseball. Bithorn, who spent four seasons in the majors surrounding two years of service in the U.S. Navy, attended Buena Memorial Presbyterian Church in Chicago , where records at PHS show his son, Hiram Jr., was baptized in 1951. The following morning we talked about the work of PHS and the Office of the General Assembly at a meeting of the Presbytery of San Juan  in Arecibo. Though Arecibo is an hour away along the northern coast highway, it is still part of San Juan Presbytery, owing to how Presbyterianism developed in Puerto Rico. After the 1898 war between the United States and Spain, five American denominations divided the majority Catholic island into zones of influence . Presbyterians focused on the western third, sending missionaries to Mayagüez, Aguadilla, and Rincón. To this day, the presbyteries of Noroeste  and Suroeste each hold twice as many churches as San Juan. After a community lunch provided by church members and several cups of maví, an elder recommended that we contact a minister in Rincón named Rev. José Colon-Rodríguez, author of an ongoing series of historical texts on Presbyterianism in Puerto Rico, Nuestras Raíces en la Historia. I contacted José after returning to Philadelphia and have been receiving from him over the summer his evocative accounts of the growth of Presbyterianism in Puerto Rico, along with selections of his personal papers --the first Puerto Rican personal papers collection to be represented in the national archives of the PC(USA). Wherever we went people asked if we intended to visit El Guacio . The Centro de Servicios Cristiano, El Guacio is the camp and conference center of the Sínodo Borinquén  and a key node of Presbyterian memory on the island. Generations of young Presbyterians have attended camp there, met future spouses, worshipped on Easter Sunday mornings in a bamboo aerie high above the valley, and played volleyball. We headed there after the presbytery meeting, ascending toward the city of San Sebastián along hurricane-damaged roads. We gradually lost contact with our phones’ GPS satellites and missed several turns on one-lane mountain roads. Just when it seemed we'd need to turn back, a last switchback brought us to a sign for the camp. 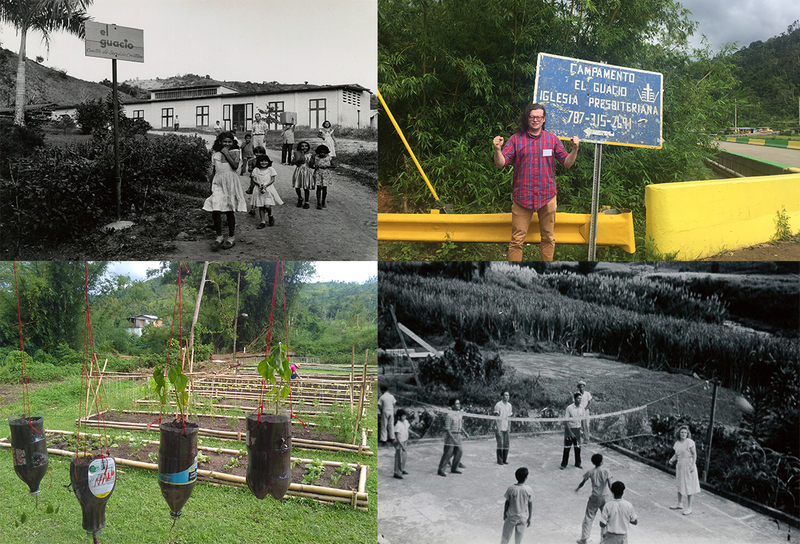 At El Guacio we talked with a local church group running an experimental garden on the campgrounds. Despite crashing their picnic we were treated to excellent coffee, a lesson on tropical hydroponics, and a tour of the grounds. The main outdoor worship space, once a canopy of three-story high bamboo, had been destroyed by Maria. And yet the overall feeling of the grounds was one we noted elsewhere on the island: of resoluteness in the face of destruction, and an eagerness to improve on anything the storm had damaged. Sunday morning we packed out from La Casona, worshiped at La Iglesia Presbiteriana Hugh O'Neill, and made our way to the airport, checking two carefully-packed boxes of records as baggage. 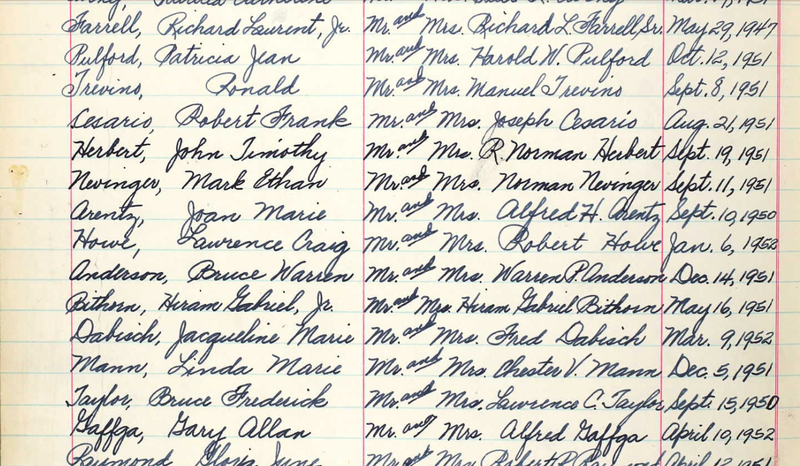 That Monday, the records became the first group from a Puerto Rican congregation  to be housed at PHS, a collection we look forward to expanding in the future with help from our Boricua friends. In front of La Casona, 2018. 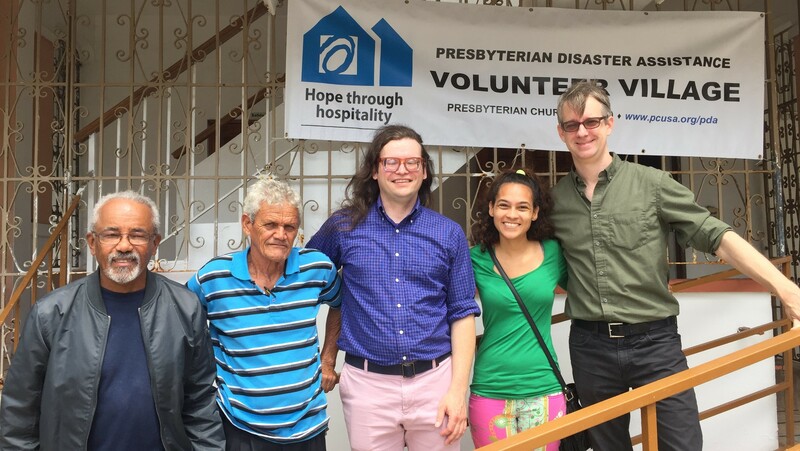 OGA delegation finds resilience and hope among church leaders in Puerto Rico , by Rick Jones, Office of the General Assembly, Sept 2018. Presbyterians in Puerto Rico , a growing collection of images from PHS's Pearl online archives.